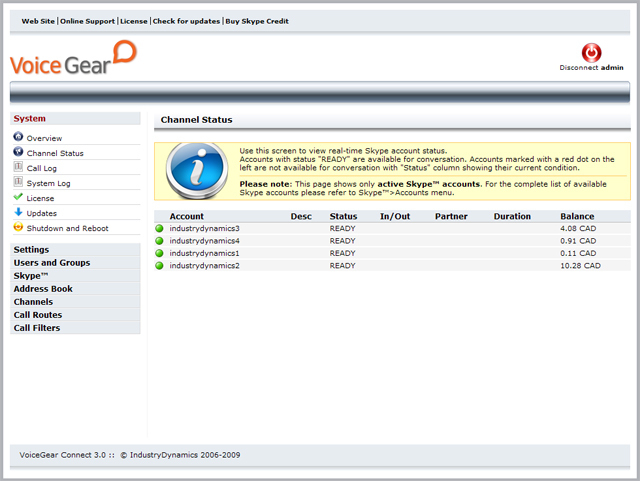 VoiceGear Connect Enterprise Edition is a revolutionary Skype Gateway that allows for complete integration of existing PBX systems with Skype network. VoiceGear Connect Enterprise Edition combines parallel Skype calling into a highly scalable package targeted towards large organizations and enterprise users. VoiceGear Connect Skype Gateway acts as a bridge between your current phone infrastructure and Skype VoIP network enabling you to make/receive up to 60 concurrent Skype calls right from your existing office desk phones. VoiceGear Connect Enterprise Edition is the most advanced Skype gateway in the world, compatible with most PBX systems no matter whether it is Analog, Digital, VoIP, or Hybrid. Simply connect the gateway to the Internet and to your company PBX system and start making Skype calls from existing telephone handsets without changing anything in your telephony infrastructure. Advanced telephony features such as IVR, three-way conferencing, call forwarding and call transfer already available with your PBX system are seamlessly incorporated into Skype calling. Using VoiceGear Connect Skype Gateway in your business can reduce your telecom infrastructure costs and operating fees by 30-90 percent given that most Skype calls can be made free or at a fraction of the cost as compared to traditional long-distance providers. VoiceGear Connect Enterprise Edition features native support for SIP voice over IP protocol enabling it to route calls between SIP PBX systems and Skype. This provides huge savings on telecom expenses, while encouraging cost-effective communication among distributed offices, subsidiaries, and customers. The power of Skype can now be integrated into VoIP PBX systems such as Cisco Call Manager and Asterisk without requiring any hardware interfaces. 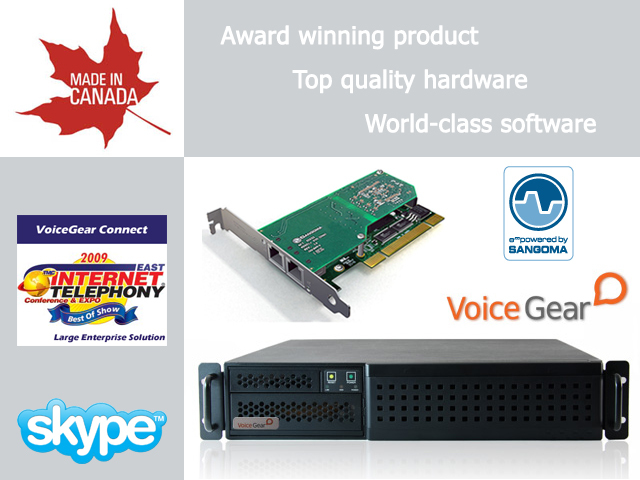 VoiceGear Connect Enterprise Edition is the only Skype gateway in the world offering connectivity to Digital (ISDN PRI) PBX systems by delivering up to 48 Skype lines with T1 connection in North America and Japan and up to 60 Skype lines with E1 connection available in other regions of the world. 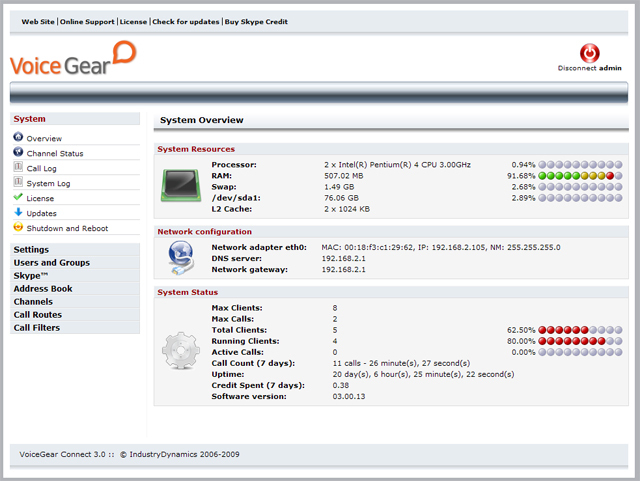 VoiceGear Connect Enterprise Edition is an ideal solution for businesses or branch offices with 300 users and under. VoiceGear Connect automatically finds free lines for both incoming and outgoing calls, meaning that multiple people in your organization can simultaneously talk on Skype. VoiceGear Connect Enterprise Edition is perfect for companies with multiple locations, remote employees, or customer-centric organizations looking to bridge the gap between the company and their customers, both domestically and internationally. Simply install multiple VoiceGear Connect Skype gateways in each branch office location and take advantage of FREE Skype to Skype calls for all intra-office communications. VoiceGear Connect Enterprise Edition offers a multitude of features targeted towards reducing communication costs and increasing productivity of your office employees. 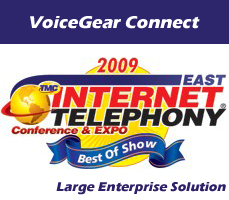 VoiceGear Connect Enterprise Edition allows business of all sizes to leverage Skype, the world's largest VoIP network, as a trunking solution for their existing office PBX systems. Utilizing Skype trunking as an alternative to the PSTN, businesses can substantially save on both domestic long-distance and international calls. VoiceGear Connect Enterprise Edition offers SIP connectivity to most IP and hybrid PBX systems utilizing SIP G.711 codec. 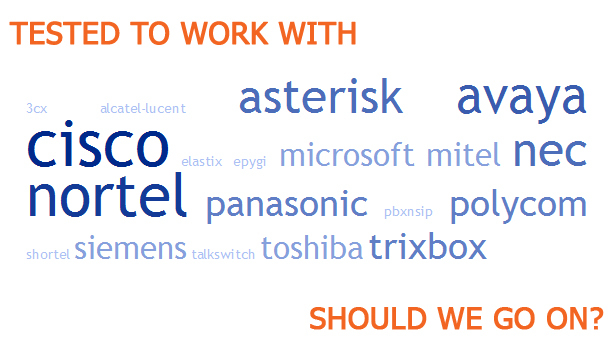 Native support for SIP connectivity extends the ability of VoiceGear Connect Enterprise Edition to work with Asterisk based PBX systems by delivering high quality voice for up to 60 Skype channels. 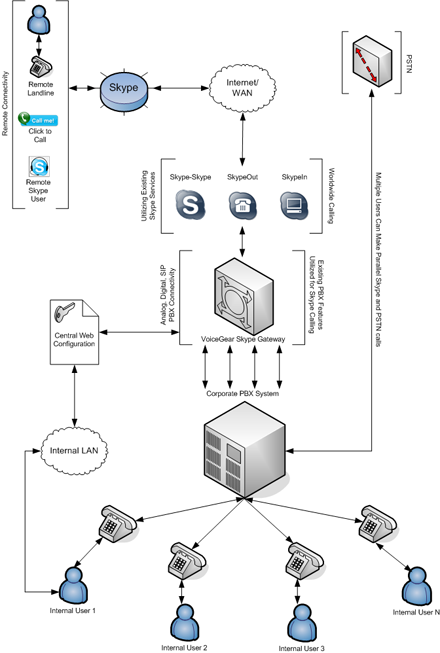 In addition to SIP, VoiceGear Connect Enterprise is the only Skype gateway in the market capable of supporting Digital (ISDN PRI) PBX systems by delivering up to 48 Skype lines with T1 connection in North America and Japan and up to 60 Skype lines with E1 connection in other regions of the world. VoiceGear Connect Enterprise Edition offers a variety of connectivity options to any PBX system with available extension-side (FXS) or trunk-side (FXO) ports. We also support mixed connectivity option by utilizing both FXS and FXO ports available on the PBX. Mixed FXS/FXO connectivity is unique to VoiceGear Connect products and is essential to implementing advanced calling features. Dual FXS/FXO connectivity also simplifies installation and lowers your costs if all ports are in use by allowing the addition of line cards instead of more expensive trunk cards. 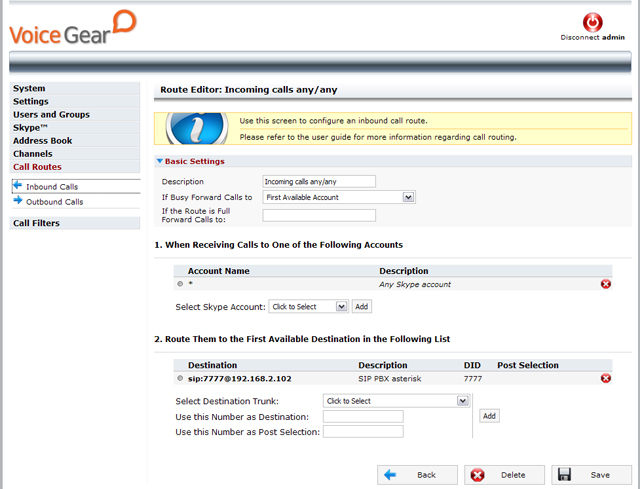 VoiceGear Connect Enterprise Edition brings you Click-To-Call feature, which allows customers to call your company PBX directly from your Web site. 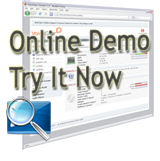 Customers browsing your Web site can reach Customer Service, Sales or Support departments absolutely free over the Skype network with a simple click of a button added to your Web site. This can significantly reduce your costs for providing Toll-free numbers to customers.